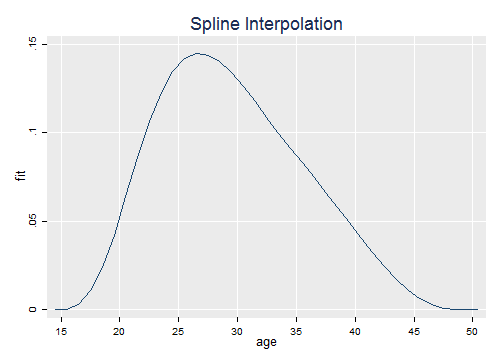 Splines can also be used for interpolation. Here we reproduce the results in the article by Mc Neil, Trussell and Turner listed in the readings. Their objective is to produce single-year fertility rates by interpolating in a five-year schedule. This log is fairly technical and you may wish to skip it unless you have an interpolation problem at hand. The gist is that polynomials can be troublesome while splines are better behaved. With 8 data points we can get an exact fit using a 7-th degree polynomial. Let us reproduce Figure 1 in the article, showing that polynomials don't work very well in this case. We need age^2 to age^7. 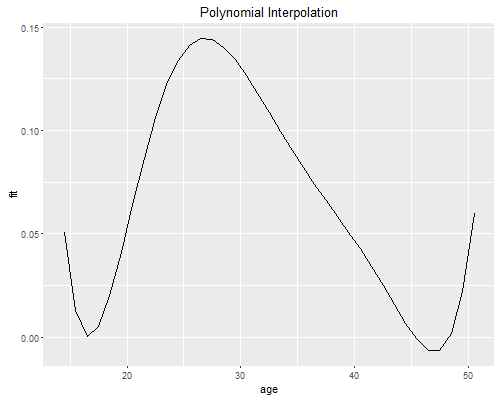 R can build orthogonal polynomials for us. Because the fit is exact the residual sum of squares is 0 and the standard errors are undefined, so we will not print the results. 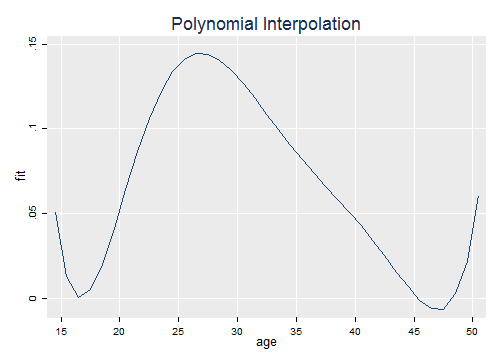 Obviously the polynomial is not well behaved at the extremes. This type of result is not unusual with polynomials. McNeil et al. 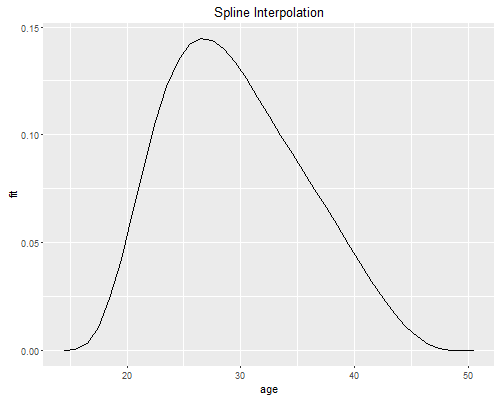 use a spline of degree five with internal knots at ages 20(5)45 and restricted to have zero first and second derivatives at ages 15 and 50 in order to ensure good behavior in the tails. The 5th degree polynomial has 6 parameters, the knots add 6, and the restrictions subtract 4, for a total of 8; exactly the same as the polynomial. The article shows how to set up a system of linear equations to compute the coefficients, which can also be done via regression. To check our results against the paper we will rescale age so we work with 0(1)7 instead of 15(5)50. You should probably list the data to have a look at the structure. To get the coefficients we run a regression. The fit is perfect so we suppress detailed results. we use solve(), but could use lm() as well. The coefficients are exactly the same as in the paper (see page 252), with the first three rounded to zero. Next we need a prediction dataset in single years, with the power and knot terms but not the derivatives. Obviously the restricted spline is much better behaved at the extremes!